A somewhat mysterious slide from September 1959. I found it in a box with architectural slides of San Francisco's Mission District, but if this is San Francisco, then it is a part of the city I have never been to. It's not shot on Twin Peaks, since you wouldn't see these tall hills in the East if we assume that this is around sunset time. 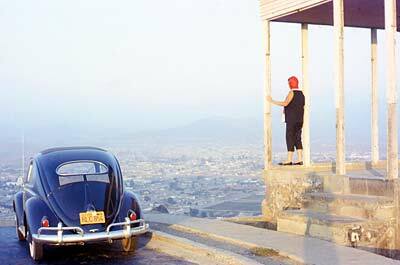 That's a sharp looking late-50s Volkswagen Beetle this couple was taking up into the hills. Sunroof, white wall tires and a radio which was probably playing some Henry Mancini tunes at the time.